The media encountered an intentional news blackout at Mar-A-Lago yesterday. 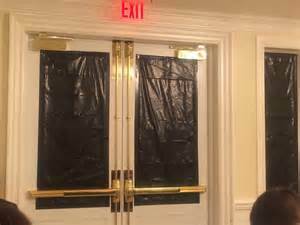 When reporters arrived at Trump’s Palm Beach resort to cover his golf outing with Japanese Prime Minister Shinzo Abe, they found themselves in a press room whose windows and glass doors had been covered with black plastic material. Presumably, the immediate intent of the visual blockade was to prevent the press from photographing Trump and Abe playing golf. It’s rather far-fetched to think that not allowing photos was a security measure: It’s golf. But it is plausible to conjecture that Trump just doesn’t want people to witness his ineptitude on the golf course or to see him cheating; or perhaps to take an unflattering photograph of him out of his customary baggy suits and overcoats and wearing, instead, casual clothing that reveals more of his girth. To add irony to an already absurd situation, photographers were advised to not take pictures of the covered windows and doors, because they were on “private property.” So, there was an attempted blackout of coverage of the blackout. Fortunately, some reporters did not obey. The plastic-bag news blackout may, at first glance, seem like a bizarre act designed to protect Trump’s fragile ego. At first, it can strike you as a comical effort. It’s humorous, too, to think about the unfortunate Mar-A-Lago employee who was ordered to tape Hefty bags to the windows and glass doors, and what that person must have been thinking when he or she got the assignment. But I think there’s more to it than that. By taking this action, Trump is literally — and probably inadvertently — showing us exactly how he wants to treat the press. He doesn’t like his actions made public. He wants to work behind closed doors, out of sight of the press and unaccountable to anyone. Public scrutiny that he doesn’t control doesn’t fit his unfettered-CEO view of what he should be able to do. He views First-Amendment press freedoms as an obstacle. We’ve already seen the first steps toward limiting freedom of the press. Trump’s accusations of “fake news,” and his threats to “open up libel laws, ” and his repeated use of the term “dishonest” to characterize the press are leading indicators. He has threatened to revoke press credentials for newspapers and media outlets that challenge him or don’t “advance his agenda.” His press secretary, Sean Spicer, is belligerent at press briefings, and, most recently has been giving priority to questions posed by reporters from news outlets considered friendly to the administration. So as we chuckle at the comic clumsiness of trying to blindfold and shut out the press from a presidential golf outing, we need to remember that the plastic -bag news blackout is not a joke. It’s a physical manifestation of where we could be headed.